Some residents reported their houses shook as the Typhoons passed overhead. ROYAL AIR FORCE jets were launched today to intercept a Latvian cargo plane which they then escorted to Stansted, London. Sky News reports that police have searched the Russian built plane and it is expected to continue its journey to Birmingham tonight. 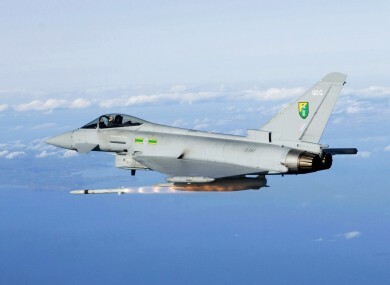 The plane had failed to communicate with air traffic control as it entered UK airspace and so the RAF was deployed. Kent Police said it had received calls about a ‘loud bang’ which it told followers on Twitter was believed to be related to RAF activity. One woman said her whole house shook as the aircraft passed overhead. Another man said his elderly mother was “in a terrible state on the phone”. The air force later confirmed that typhoons were launched to intercept a civil aircraft. Typhoons launched to intercept a civil aircraft. It was safely escorted to Stansted. Our aircraft cleared supersonic during the scramble. Apologies if we startled you during the successful intercept this afternoon - we only go supersonic over land when absolutely necessary. Email “RAF escorts cargo plane to Stansted, apologises for 'loud bang'”. Feedback on “RAF escorts cargo plane to Stansted, apologises for 'loud bang'”.